South African crime fiction is bracketed by two writers who started out as crime reporters, James McClure and Deon Meyer, but other than that fact the two writers and their novels have little in common. McClure is English, writes in English, and is basically a satirist. His crime novels pair up a white cop and his black sergeant, in the age of apartheid. One lives in a house, the other in a dirt-floored shack. Their interaction is strictly determined by law and custom. Their creative misuse of that law and custom is the basic premise of the series (which is overtly racist, in a satirical manner, and also sexist, but without the benefit of satire). These characters cannot survive the end of apartheid: the author suggests, as a reason that his series did not continue, that both will die in the turmoil and retribution surrounding the pre-reconciliation days: neither side is able to appreciate the characters' contribution in dealing with people regardless of apartheid, and both will take the rap for propping up the system by upholding the law in a corrupt and unjust society. Three novels by Wessel Ebersohn follow a Jewish medical examiner through the thickets of crime in a criminal society, but the bleakness of the outlook (perhaps a pessimism that the society would ever change) casts a pall over the plots. Another writer who coped with the culture by lampooning apartheid in its heyday, also in English, was Tom Sharpe, who went on to write academic comedies once he returned to England (after being kicked out of South Africa)--Sharpe's two South African novels are technically speaking police procedurals, but in fact are riotously funny travesties of life in South Africa. If satire and comedy were the only means of dealing with the realities of apartheid, noir fiction may be one of the best ways of dealing with the harsh realities (and possibly the high hopes as well) of post-apartheid South Africa. Two writers, both based in and writing about Cape Town, one of the most beautiful cities in the world and, despite a high crime rate, one of the safer cities in the country. One of them, another English speaker, is Michael Williams, a writing teacher whose writing is paradoxically a bit wooden. His best book is Hijack City, which pairs a younger white detective with a black mentor. Williams's portrait of racial realities in the new Cape Town, but the portrait is accurate even though the author's point of view is a bit self-righteous or politically correct. More interesting and even more accurate in catching the tone of the new reality is the work of Deon Meyer, an Afrikaans writer whose work is a fascinating window on a new Afrikaans point of view. Dead Before Dying, actually his first novel, has just arrived in the U.S., following Heart of the Hunter (actually published 3rd in its original language and in England) and Dead At Daybreak. The novels are marginally interconnected but in fact independent, not a series. In Dead at Daybreak, detective Mat Joubert is a wreck, his wife has died, he has a new boss who's a bureaucrat more than a cop, and he can't drag himself out of the bottle. His current case, through which he'll have to prove himself to his new boss, concerns murders committted with a pistol that has a long heritage in the old South Africa, and Joubert has to confront his own pain with that of the grieving families of the murder victims. But there is considerable humor as well as "tourism" in this glimpse of crime and redemption in the new South Africa. 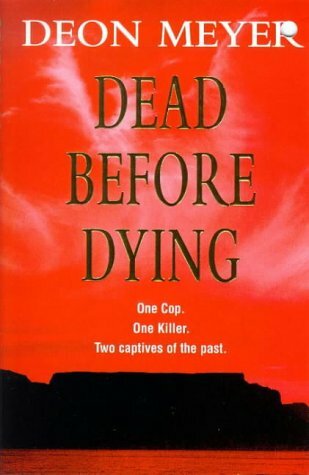 In Dead at Daybreak, former cop Zatopek van Heerden is hired as a private investigator to find the missing will of a murdered antique dealer, and in alternating chapters his own story, leading up to his partner's death, his guilt, and his leaving the force, is told. This book is more skilful perhaps than the first novel, but both stand up very well. The third book, Heart of the Hunter, concerns a reformed Xhosa assassin (whose story overlaps with van Heerden's in this book and the previous one), on the run across the country. Heart of the Hunter indulges the author's love of motorcycles, and it's a thriller plus road movie that gives a fascinating panorama of South Africa--but to me the thriller plot is less interesting (less "noir" maybe) than the 2 cop stories, though the portrayal of a black hero (even if by a white writer) is an interesting development (something similar occurs in one of the Wallander novels by Mankell, but the author is ultimately interested in another of his geopolitical plots rather than in the black character (Afrikaaner nationalism, Russian intelligence agencies, and an international plot with "high stakes"). Meyer's book is more authentic, concerning South African and his Xhosa her, but I guess Heart of the Hunter is more myth-making than noir fiction, and though the myth is told in an interesting way it's finally a bit too heroic to quite fit in the classic noir genre. But its success has brought us American editions of the first 2 books by Meyer, and we can hope others will follow (I can't quite tell if there are others already published in Afrikaans that are awaiting translation--does anybody know? ).